highlight a variety of products that we personally like to use (No, we are not being paid to endorse these products!). While cost will vary, we try to present items that are affordable to most dads. For tips postings, we will focus on techniques that will help make your adventures safer, more successful and more enjoyable for you and your kids. We hope you enjoy what you read and watch. Please share with us the tips you’ve learned or the products you and your kids like to use! AdventureDad.org viewer John O’Connor writes in on the importance of using hearing protection when hunting and shooting. Hunting has been a popular pastime for many years in the United States. From the early ages when hunting was used mainly as a source of food to now although still used for food, hunting as a popular hobby and sport for families to engage in together as well. Regardless of your reasoning for hunting, it is vital that while out in the field or at the range you and your family are equipped with proper hearing protection at all times. As a child I remember helping my father gather together all of his gear the night before a hunt. We would sort everything out, make sure he had it all, and pack it into his truck. I would always ask him a ton of questions, about the guns he used, the animals he would be hunting for and which of his friends would be accompanying him this trip. We would discuss stuff like this for hours, but as I look back to our times spent together talking about hunting I rarely remember having any conversations about the importance of wearing hearing protection while hunting. From the first time my father shot a gun to the last time I helped him pack up his truck I never saw him with hearing protection. As an avid hunter my father spent much of his free time either out in the woods or at home teaching me the ropes of hunting so one day I would be able to go out on my own and eventually teach my kids the ins and outs of the great outdoors. Although a very experienced marksman my father often times when out in the field did not pay much attention to his hearing protection. Even though he knew what a blast from a firearm could do to a person’s hearing he would often argue that he could not feel any signs of hearing loss so why should he have to protect against something he doesn’t even have. Little did he know that every time he fired his gun without protection on he was further damaging his hearing levels. Even though my father never wore hearing protection he always made sure that myself and the rest of my family had a pair of earmuffs on at all times. He did not follow these guidelines in regards to hearing protection but he wanted to make sure his children were properly educated on this issue to ensure that we were always protected and to make sure that as we grew older and continued on with the family tradition of hunting that we were teaching our children the right thing to do as well. My father is now in his late 70’s and is severely affected by hearing loss. Although hunting is not the only cause of his decreased levels of hearing his doctor has said that it did play a major role in damaging his eardrums. My father wears hearing aids in order to amplify the sounds around him so he is able to hear well. Looking back on his hunting days, although he is sometimes upset that he chose to not wear hearing protection he is glad that he always made sure his children were protected at all times and that he instilled the proper hunting guidelines so that we could continue on teaching others the proper ways to hunt in the future. Many people today realize what hunting can do to a person’s hearing but still choose not to protect themselves. Researchers have found that being exposed to sounds over 80 dB for long periods of time can cause permanent hearing damage. A shotgun can produce sounds upwards of 140 dB; almost double the advised level of noises that a person can be exposed to unprotected. Although hearing loss can happen gradually over time, exposure to sounds at 140 dB just once can cause hearing damage. That is why it is important for everyone, adults and children to always be protected when around guns. It does not matter if you are shooting in the woods, practicing at the range or watching someone shoot, everyone must be protected at all times. Just like anything else it is important to start things at a young age. That is why it is important to have your children wear hearing protection when they are young so they feel comfortable doing so and so they can learn the reasoning behind why they should always be protected when around gunfire. Even though my father did not wear hearing protection, it is important as adults for us to lead by example in regards to wearing hearing protection. In order to ensure safety for all when hunting there are a few different options that you can choose from when looking into hearing protection. The first line of hearing protection that people often look towards is a pair of earplugs. Earplugs although they protect against hearing loss are not always the most effective form of hearing protection that should be worn when hunting. In order to ensure maximum safety when out in the field the best option to look at would be electronic earmuffs. Often a complaint by hunters is that when they wear hearing protection they are not able to hear other hunters in their group or game that may be approaching in the area. Electronic earmuffs allow hunters to hear noises that are under 80 dB while blocking out any sounds that exceed this level. This enables hunters to hear game and others while providing maximum protection at all times. Whether you are just starting to hunt, teaching your children to hunt or have been hunting for years it is still extremely important to make sure everyone involved is fully protected at all times. Hearing loss is not geared to one age group; children and adults can both be affected equally especially when around gunfire. To ensure healthy hearing healthy for you and your children in the future take the proper precautionary steps in protecting your hearing today! Hi my name is John O’Connor, I am a father, outdoorsman and passionate about living a healthy lifestyle. Over the past few years I have become more and more interested in hearing loss. My father and grandfathers, who are and were all hunters, are affected by hearing loss. I feel that there is a general lack of understanding around the issue and it is our job to spread awareness where we can. Check out my new blog at bloggingwjohno.blogspot.com! Founded in 1880, St. Elmo, CO is no longer an official municipality of the state but rather a so-called “ghost town;” in 1922 when the narrow-gauge rail road stopped running and the gold and silver ran out, the population of St. Elmo seemingly disappeared over night. The town was initially founded during the heat of the Colorado gold and silver rush. The surrounding hills are home to nearly 150 mining claims including the famous Iron Chest mine. 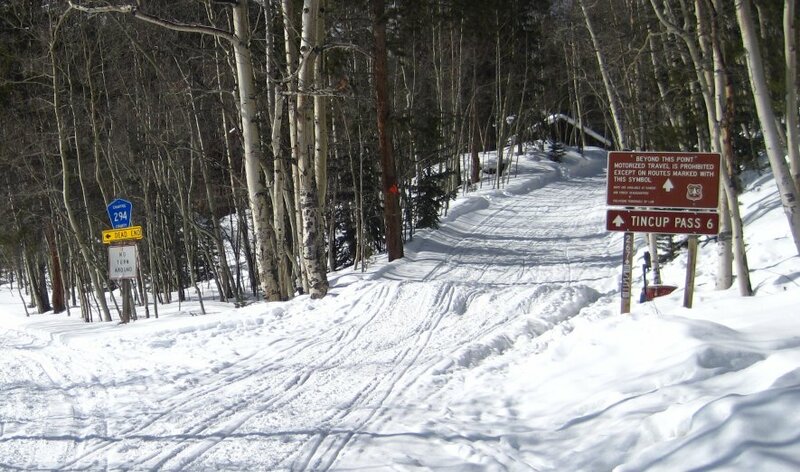 St. Elmo is a wonderful winter destination for snowmobiling, cross country skiing, and snow showing, as well as some beautiful photography. Three hours from Denver and four and a half from Grand Junction, St. Elmo is located in the center of Colorado in Chaffee County. The town is only a few miles west of the Arkansas valley and settled at the base of Mt. Antero, Colorado’s richest aquamarine deposit. Cabin rentals are available in St. Elmo; for more information visit http://www.st-elmo.com/townhistory.html. ATV rentals are also available, but only in the summer months. From the ghost town, one can travel to Tin cup pass, the mining towns of the past Hancock and Pomeroy, visit the historic Alpine Tunnel, or simply enjoy St. Elmo itself. 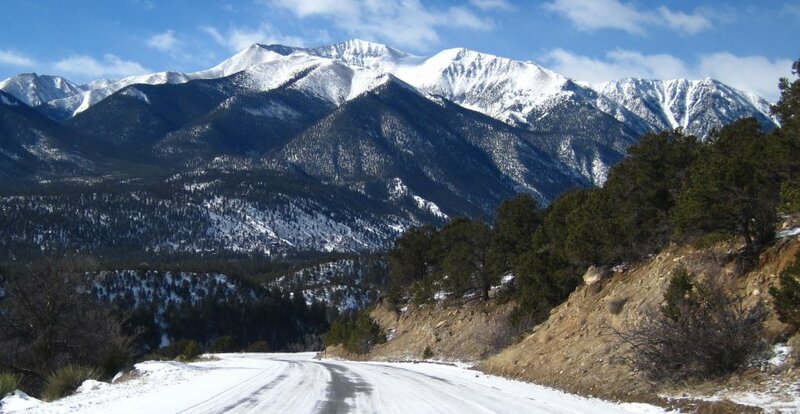 Camping is available in the area, as well as is lodging in nearby Buena Vista or Salida. Nestled at the base of fourteen thousand peaks, Mt. Princeton is one of the most scenic and secluded destinations in Colorado. Although not officially a town, Mt. Princeton is neighborhood of privately owned cabins and a hot springs resort. The resort offers room rentals at its lodge, or more remote cabins that take a bit more effort to access. The mineral-water pools bubble alongside chalk creek, aptly named for its proximity to the famous chalk cliffs on the south side of Mt. Princeton itself. 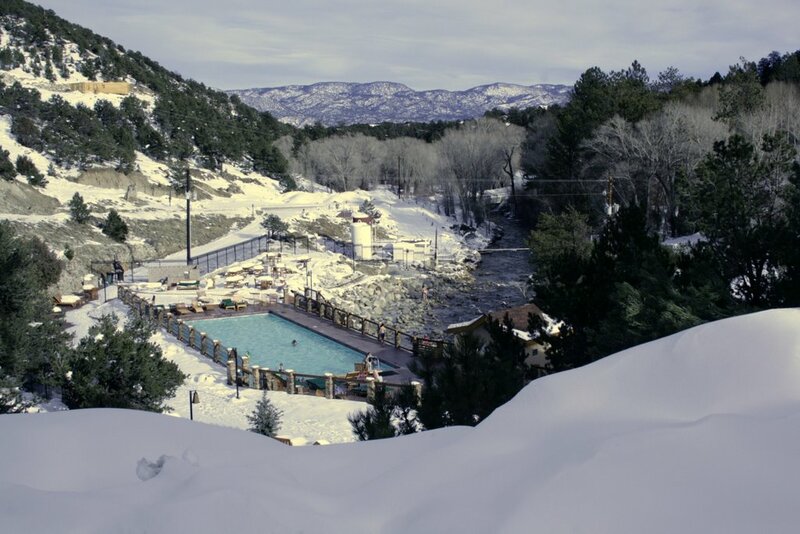 The 103 degree hot spring waters flow from the ground into a large, lap-style pool which is accompanied by a cool-down pool. Smaller soaking pools are available, but the traditional way to bathe is to make your own pool of rocks in the chalk creek where the hot water runs into the melt water. Information on the resort including rental rates, services, and special event offerings can be found at www.mtprinceton.com. Mt. Princeton is nearest the towns of Buena Vista and Salida, about a two hour drive from Denver or four hours from Grand Junction. Chaffee County is in the heart of the Rocky Mountains, containing the majestic Sawach range. If luxury travel is not your cup of tea, or rather hot chocolate, then try camping! Yes, it may be January but that is no reason to give in to the snow fall. Only a few miles west of the hot springs are three forest service campgrounds that are accessible year-round. Information on the San Isabel National Forest is available from the U.S. Forest Service; www.fs.usda.gov/psicc. Backpacking is also a great outlet for taking advantage of what the area has to offer. The Colorado trail runs through the area and is the perfect excuse for taking a day hike. Being located in a National Forest, Mt. Princeton is an area suitable for snowmobiling, but many locals prefer snow shoes or cross country skis. For a more touristy approach to vacation, Monarch Mountain ski resort is a short drive to the south. I recently received a piece from travel writer Karla Hudak regarding tips for traveling through the Midwest. Immediately I thought of our driving trips to St. Louis, Tennessee, and tracing the eastern portion of Lewis and Clark’s epic adventure. In particular, I remembered with great fondness Alex’s first trip to Chicago and Valparaiso, Indiana. 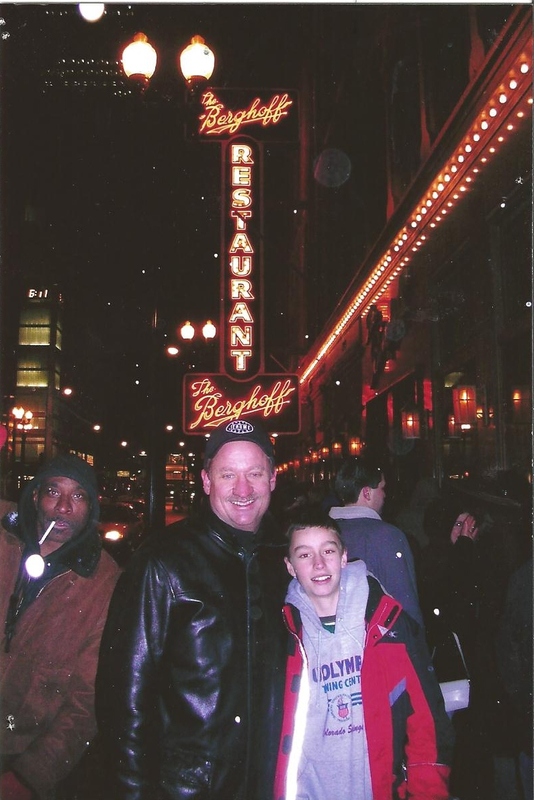 It started in Denver when I heard a story on NPR about the upcoming closing of Chicago’s oldest restaurant, Berghoff’s. Having eaten many a great meal there in college, I just had to make it back one final time and introduce my son to it as well. So, on a cold, wet weekend in February, Alex and I stood outside for three hours as the line to get in wrapped several city blocks for their closing Saturday night. As you can see in the picture, the wait was worth it as we settled down to plates of snitzel, potato pancakes, pasta and some Berghoff’s famous home brew for Dad. The rest of that trip include driving along the lake shore, seeing the World War II U-Boat at the Museum of Nature and Science, walking along the shops in the miracle Mile and simply enjoying the atmosphere inside the Chicago Loop. We also worked in a tour of the Valparaiso University campus, saw the vacant lot where my fraternity once stood and enjoyed the best pizza in the world at Greeks Pizza. Thanks to leisure travelers choosing to make close-in trips, the tourism levels in Illinois are back to pre-recession levels for 2011, according to ChicagoTribune.com. More than 93 million people traveled to Illinois last year, which was 10 percent more than in 2010. Families living in the Midwest can enjoy a great road trip within the 12 Midwestern states for less money and hassle than traveling farther away. Make your journey more fun with these ten quick travel tips for a great road trip through the Midwest. Consider a guidebook like the Midwest Getaway Guide to help you plan your trip. Guidebooks have maps, festival information and ideas for day trips, weekend getaways and longer vacations. If you find yourself somewhere without Internet access or with a depleted cell phone battery, you will be glad to have physical maps nearby to rely on. A cooler filled with snacks and cold drinks saves you the hassle of pulling over every time someone needs to quench their thirst or fill their stomach. Satellite radio lets you listen to your favorite radio stations wherever you go, not just in town. Identity theft is a very real problem when people go on vacations. Make your vacation more relaxing by signing up for an identity protection program. You can actually find in-depth, background information on companies like Lifelock on Crunchbase. Lifelock monitors your identity for suspicious behavior and tracks your credit score. A program like this can definitely give you piece of mind when traveling to foreign places for the first time. A GPS navigator does not just give you directions; It can also help you find restaurants and hotels or alert you if you miss an exit or turn. Only take what you need. Bring as few shoes and clothing items as possible. Leave laptops, purses, and even wallet at home if you can. Not only do these items take up extra room, but bringing them with you means they can be stolen- along with your identity. You do not need all of your credit cards or IDs for a road trip, and you definitely should not need checks. You may need to stop somewhere to connect to a Wi-Fi hotspot during your trip, perhaps to check on a hotel reservation. Only make reservations and pay from secure sites or you may find your accounts hacked into, leaving you without any gas or food money. Thieves sometimes install card readers at ATMs. Typically, ATMs inside of banks are safe. Most locations have smartphone apps that let you easily find the nearest banking center with an ATM. Chicago is the largest city in the Midwest with a population of 2,853,114. With so many great places to visit in the Midwest, it can be challenging to pick where to go. Chicago is sure to have something for everyone, and you can find out more about what the city has to offer with Eyewitness Travel Guide- a great trip resource. Although you will see plenty of fun places to make unplanned stops on your road trip, resist the urge unless it is something truly special. Deviating from your plan can throw off the whole trip and add stress as you try to make up for lost time. These ten quick travel tips for a great road trip through the Midwest should make your family’s vacation more fun and hassle-free! Come Join Us! Saturday, September 8, 2012 for the second annual Whole Man Expo. Located at The Cable Center, 2000 Buchtel Blvd., Denver, CO 80210, the WME will explore enlightened masculinity through dynamic presentations to honor and celebrate men’s goodness. The event is not limited to men, but open to all families. Pre-registration is required and can be done at: http://mensanthology.com/whole-man-expo/. www.castlerockradio.com, to listen to Craig talk about his early adventures, a life changing experience, getting into your kid’s “flow” and three tips for successful adventures! You can also find an archive of Doug’s other programs.